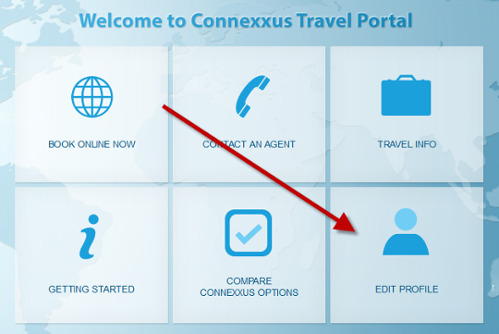 Find out how to set up a traveler profile on Connexxus. 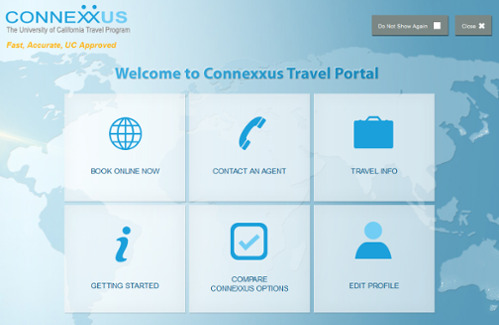 Note: You must establish a profile to book university business travel through Connexxus, UC's travel program. To receive Connexxus discounts at Starwood hotels you must also enroll in Starwood's preferred guest program. Travel preparers: The initial profile must be created by the traveler. If the traveler prefers to have you complete their profile, they must first complete the required fields (first name and middle initial, address, city, state, zip code, country, business phone, and preferred airport) and assign you as the arranger with Can Access privileges as described in Step 2 below. Note: Travelers have the option of submitting an Arranger Assignment form to UCTravel@ucop.edu authorizing UC Travel Management Services to access the traveler's profile and assign a travel arranger(s) on their behalf (up to four travel arrangers). If you're already logged into Single Sign-On (SSO), you won't see the SSO log-in screen. Proceed to step 2. If you aren't already logged into SSO, enter your SSO username and password. 2. Create a traveler profile. Note: Sessions will time out after 30 minutes. Remember to click Save as you're entering information to prevent losing your work. Click the Edit Profile icon from the welcome page. Personal: Enter your name, home, and emergency contact. Business: Enter your work address, phone, and email. Enter the arranger's last name in the search field. Select travel arranger's name from the drop-down list. Click the Can Book and/ or Can Access check boxes to assign travel arranger's privileges. Can Access: Arranger can view and update your profile information. Can Book: Arranger can book travel for you. Preferences: Enter your air, hotel, and car preferences. Payment: Enter your UC San Diego Travel Card information under Company Card and select how your card should be applied for travel reservations. Note: The Air option does not apply as airfare is charged to UC San Diego's corporate account. Loyalty: Enter any airline, hotel, or car loyalty program information. Documents: Enter your passport and visa information. Note: The traveler's last name is read-only. UC San Diego provides last names in a specific format to meet airline ticketing requirements (no hyphens, apostrophes, spaces, or non-alpha characters). Manage and update your profile information in the future, as needed. 3. If you need to book travel, choose a booking option. For guidance on which option best fits your travel situation, click Compare all Booking Options on the Connexxus welcome page. To review booking fees, click Agency under Partner Programs in the left-side bar. Select either Book Online to make reservations or Contact an Agent/ For Assistance, depending on your travel situation. Select Book Online to make reservations. Note: Direct bill is unavailable through Southwest, you can use your UC San Diego Travel Card to make arrangements. Print your confirmation if booked online. Note: You must have a UC San Diego travel trip prior to booking travel. A trip number is issued once you create a new trip in MyTravel, UC San Diego's business travel preauthorization requirement.